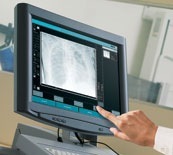 The CR 30-X digitizer for computed radiography (CR) is a compact, tabletop digitizer for decentralized CR environments. It combines high image quality with high throughput. 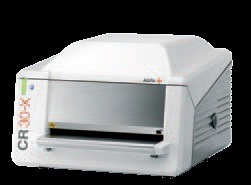 Easy to install, use and maintain, it provides seamless integration, from X-ray exposure to print or softcopy. Using dedicated cassettes that are inserted horizontally, the CR 30-X requires minimal space and easily integrates in vans, trucks and other mobile facilities, or other places where space is an issue. CR 30-X offers an ideal solution for private and decentralized CR environments, including decentralized hospital departments, orthopaedics, chiropractics, military and veterinary applications. The CR 30-X scans at a spatial resolution of 10 pixel/mm, then processes the image using MUSICA² - Agfa HealthCare's patented, market-leading intelligent image processing software. By scanning the phosphor plate at the full width of 43 cm, the CR 30-X provides both high quality and high throughput. The CR 30-X supports all common cassette formats. Installing the CR 30-X digitizer can be achieved in a single day. Its special LED technology in the erasure unit keeps the heat output and the power requirements lower, so that standard electrical outlets are sufficient. The lack of preliminary electrical work means the set-up cost is lower. And with its modular, component-based design, the CR 30-X digitizer offers faster, easier and more cost-effective maintenance. 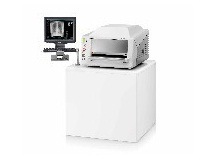 The CR 30-X works in conjunction with Agfa HealthCare's NX - the CR's image identification and quality control workstation designed to enable users to complete effortlessly, and with minimal training, a complete digital X-ray exposure. In addition, the CR 30-X uses MUSICA intelligent image processing software to automatically optimize the final image quality without the need for human intervention. Designed to enable a seamlessly integrated digital workflow, the CR 30-X uses DICOM protocols for all steps in the digital workflow. An exceptional tool for improved radiography workflow and efficiency. NX is the radiographer's image identification and quality control tool. It has an intuitive interface on a simple touch screen that offers complete ease of use at the point-of-care. Agfa's image processing ensures less time adjusting for faster image delivery to the radiologist. And NX communicates seamlessly with the hospitals PACS, RIS and HIS systems for improved interoperability. The hybrid touch screen/mouse with intuitive interface for efficient workflow. The most frequent tasks are accessed quickly and easily on a touch screen, while a click of the mouse calls up an array of precision tools. With the intuitive interface, only minimal training is needed to work effectively on NX. Advanced MUSICA image processing tool – ensures excellent image quality. Agfa's image processing ensures less time adjusting for faster image delivery to the radiologist.